TPC Overall Rank: #159 out of 2933 rides. User Tracker Count: 178 times. Like the ride. Thought they could of done more with the theme during the ride. This was probably the worst of the major coasters at Kennywood. This still was a good "worst" coaster though. The theming was great and there was plenty of spinning during the ride. Best of all, it was actually smooth. Very cool spinning coaster. The theming was excellent and really enhanced my ride. The entire ride was pretty smooth and the drops were zippy and as good as always. Also, the second half had tons of spinning to boot. This is probably my favorite spinning mouse to date. With 3 people, we got some great spinning, and I liked that it was enclosed and had all the lights and stuff (especially since it worked!). Its a pretty fun ride but not something I would want to wait in line too long for. Upon re-riding this after a couple of years, I had to review it, if not to just give it a score. The theming is pretty good, but it just seems so damn original (at least Ive never been on anything like it). Since I love coasters, dark rides, and most flats,and it seems to fall into all 3 catagories, whats not to love? Also, I was pretty impressed with the young, but enthusiastic staff of ops. I highly recommend this ride. This ride felt like one of the most brilliant additions to Kennywood park of all time! Theming was excellent, i swear the changed the ride a little bit (i dont know if they can) for the 2007 season, there was spining in the middle of the ride and at the end and i thought it was really fun. I would not voluntarily eat raw lettuce leaves. On the other hand, I would probably not drink a bottle of salad dressing. But I WOULD eat lettuce with salad dressing on it. This is how I feel about Exterminator, to some degree. The darkride elements are nothing special, other than the interesting sound effects and movement. The rollercoaster is at its best mediocre, boasting 2 good drops, and much pointless spinning. But together, it is a very exciting experience, and one of the few sci-fi themed dark rides that I have seen (funny, all 4 are cross-overs). Despite the ingenious blending of coaster and darkride, I do have several complaints about this ride. First, wild mouse coasters are meant to be ridden outside, where the sharp turns make it feel like you are about to careen over the edge! No such feeling is experienced in exterminater, due to the fact that you are fairly close to the floor for most of the ride. In addition, the lines are often long, and inside a hot humid building. Also, the loading can be a tad irritating, due to the fact that one must jump into the car whilst it moves through the station. Last of all, those of us over 5 feet tall (or some height like that) are forbidden to use the seat belt, which stabs into the back of our waists throughout the ride. But other than these shortcomings, this crossover darkride is very smooth and will have you laughing out loud before the end. Like all other coasters at Kennywood, it is a must-ride! Fun ride. The themeing is great. 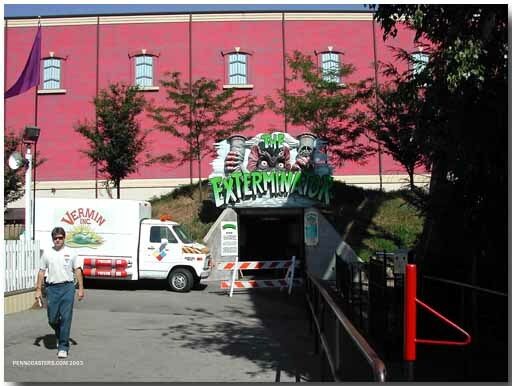 This is one of the better parts of an older Kennywood. This breaks up the normal old style park. Excellent themed spinning mouse coaster. If you add a couple more animatronics i believe it should be at a busch gardens or another theme park instead of at a basic amusement park like kennywood. The theming and indoor setting make this a better spinning mouse than, say, Ragin Cajun. Essentially, it takes the best aspects of an indoor bobsled (mild theming, the dark, etc.) and simply changes the ride style to something a little more fun, smooth, and disorienting. There is some good use of mirrors within the course (though more light on them might let one seem them a bit better), and once the actual spinning starts, you are in virtually total darkness, so it all adds up to be a highly spatially-confusing ride. Good for those that enjoy spinning rides, mice, and/or indoor coasters, but those who are easily affected by spinning may want to steer clear of this one.